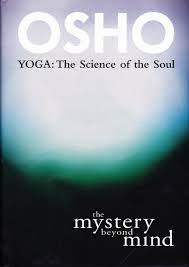 ‘Yoga the Mystery beyond Mind’ behoort tot de serie Yoga the Alpha and the Omega, over Patanjali. Yoga is een welbekende bewegingsvorm die bewustwording beoogt en daarom dicht bij meditatie komt. Veel mensen die Yoga beoefenen zijn geïnteresseerd in de wortels ervan. En ze kunnen dan zeer goed te rade gaan bij Osho’s bespiegeling van Patanjali’s Yoga Soetra’s. Van deze oorspronkelijke reeks werken zijn inmiddels een paar prachtige herdrukken verschenen. In het deel ‘The Mystery the beyond Mind’ worden technieken aangereikt om te mediteren op wat tijdens de slaap bij je bovenkomt, aangezien we tenslotte heel wat uren in ons leven slapen. Ook een manier om te mediteren op pijn komt aan de orde, alsmede het belang van actieve meditaties in juist onze tijd. De mind is als een ijsberg, waarvan we alleen maar het topje kennen. Negen tiende ligt onder water en daarom zijn we niet zomaar ‘beyond the mind’. Osho’s actieve meditaties zijn een absolute must voor dat proces. Het boek Yoga the Mystery beyond Mind is zeldzaam geworden. Mogelijk is het tweedehands verkrijgbaar via de Boekhandel. Every night before you go to sleep, you can do a small technique that will help tremendously. Put the lights out, sit in your bed ready to sleep, but sit for fifteen minutes. Close your eyes and then start any monotonous nonsense sound, for example: la, la, la – and wait for the mind to supply new sounds. The only thing to be remembered is that those sounds or words should not be of any language that you know. If you know English, German and Italian, then they should not be of Italian, German or English. Any other language that you don’t know is allowed – Tibetan, Chinese, Japanese. But if you know Japanese then it is not allowed, then Italian is wonderful. Speak any language that you don’t know. You will be in a difficulty for a few seconds only for the first day, because how do you speak a language you don’t know? It can be spoken, and once it starts, any sounds, nonsense words, just to put the conscious off and allow the unconscious to speak…. When the unconscious speaks, the unconscious knows no language. It is a very, very old method. It comes from the Old Testament. It was called in those days glossolalia, and a few churches in America still use it. They call it ‘talking in tongues.’ And it is a wonderful method, one of the most deep and penetrating into the unconscious. You start with ‘la, la, la’, and then you can go on with anything that comes. Just for the first day you will feel it a little difficult. Once it comes, you know the knack of it. Then for fifteen minutes, use the language that is coming to you, and use it as a language; in fact you are talking in it. This fifteen minutes will relax the conscious mind so deeply and then you just simply lie down and go to sleep. Your sleep will become deeper. Within weeks you will feel a depth in your sleep, and in the morning you will feel completely fresh. Devavani is the Divine Voice which moves and speaks through the meditator, who becomes an empty vessel, a channel. This meditation is a Latihan of the tongue. It relaxes the conscious mind so deeply that, when done last thing at night, it is sure to be followed by a profound sleep. There are four stages of 15 minutes each. Keep your eyes closed throughout. Start making nonsense sounds, for example “la…la…la”, and continue until unfamiliar word-like sounds arise. These sounds need to come from the unfamiliar part of the brain used as a child, before words were learned. Allow a gentle conversational intonation; do not cry or shout, laugh or scream. Stand up and continue to speak, allowing your body to move softly in harmony with the sounds. If your body is relaxed the subtle energies will create a Latihan outside your control. Lie down, be silent and still. When the unconscious speaks, the unconscious knows no language. It is a very, very old method. It comes from the Old Testament. It was called in those days glossolalia, and few churches in America still use it. They call it “talking in tongues”. And it is a wonderful method, one of the most deep and penetrating into the unconscious. You start by la, la, la, and then anything that comes you go on. Just for the first day you will feel a little difficult. Once it comes, you know the knack of it. Then for fifteen minutes, use the language that is coming to you, and use it as a language; in fact you are talking in it. This will relax the conscious mind and refresh you.